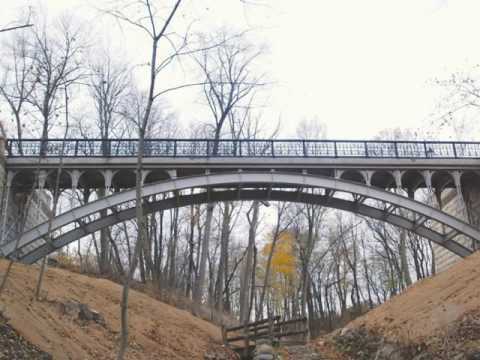 More than 100 years after construction, the historic Lake Park Lion Bridges needed rehabilitation to enhance public safety, repair structural deficiencies, and improve their original appearance in the park setting. Our structural engineers and cultural resources specialists worked closely with several Milwaukee County departments to rehabilitate these two, 100-foot-long pedestrian and bicycle bridges for the next 25 years or longer. We provided a detailed bridge inspection to document needed improvements, and designed the plans for replacing stone masonry facade and structural steel elements. Plans included cleaning and painting bearings, and removing and replacing bridge railings and concrete bridge decks. Both structures required painting of structural steel, abutment repairs, and stabilizing the lakeside bluffs on which the bridges are located. The commitment to preserve the historic character of these bridges led to unique challenges, such as very specific materials, tools and supplies that would not damage their appearance. The bridges also required temporary suspension to complete the structural work. The final bridge rehabilitation plans and specifications met Section 106 requirements and other current federal guidelines. Our efforts helped preserve this local legacy for future generations, while also enhancing pedestrian safety. “The depth and breadth of knowledge Mead & Hunt staff demonstrated was a perfect fit for this complex, unique project."